Turning off US 68, just north of Ripley, onto North Pole Road, the beauty of southern Brown County was apparent around us. The small country road was lined with old rock fences, winding along just below the hills and beside streams. We turned up the freshly graveled lane and parked just past the tobacco barn looking out toward a large meadow nestled beneath the hills and the rock lined edge of Eagle Creek. At the far end of the meadow, the dark spots moving about were some wild turkey enjoying the morning sun. The tobacco barn, no longer used to house what once was the crop that paid many farm bills in southern Ohio, was the location of the dedication ceremony for Ohio’s newest wildlife area, Eagle Creek Wildlife Area. 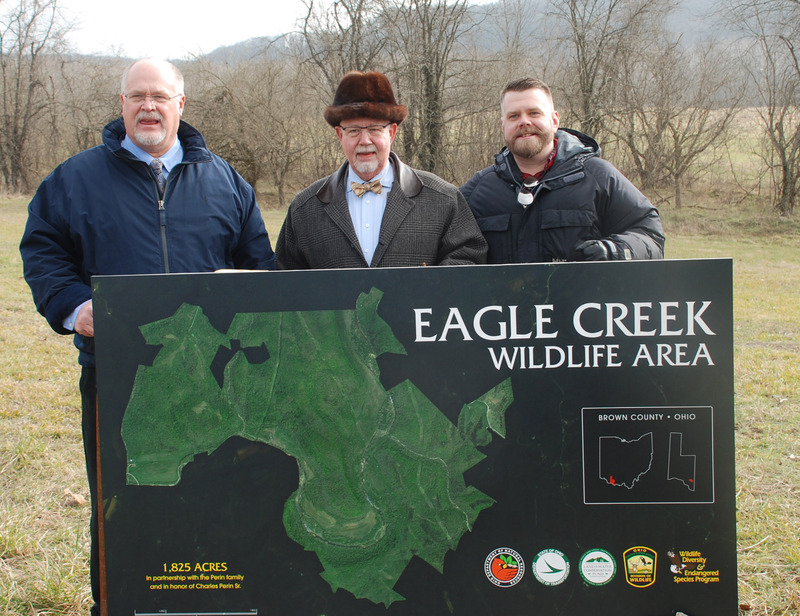 State officials including a representative of then Governor Kasich’s office, ODNR and Division of Wildlife staff, dignitaries from around the state and outdoor writers, including myself, gathered to hear the story of how this became Eagle Creek Wildlife Area. The Perin Family is at the very heart of the story. Representing the family at the dedication were Robert and Charles Perin Jr., sons of Charles Perin, and grandson Charles H. Perin III. It was the vision of Charles Perin Sr. to acquire this land. It became a labor of love throughout his, and his wife’s, lifetime. He was a landscape architect in the Cincinnati area. His training, combined with a love of nature and land, led him to begin acquiring the land. The family desire that this land remain intact with managed wildlife and natural resources for all Ohioans is a tribute to him. The result is a total of 2300 acres of some of the most diverse and beautiful land that Brown County can offer. In addition to natural beauty, the history of southern Ohio and even the opening of the original Northwest Territory has deep roots here. Representing the Perin Family were (l – r) Robert Perin, Charles Perin Jr. and Charles H. Perin III. The first parcel purchased is 1825 acres and the second remaining 475 acres will be purchased after the new fiscal year in July 2019. The discovery of the endangered bat species on the property allowed the Ohio Department Of Transportation to contribute $1-million for bat mitigation. An additional $1.76-million grant was obtained from the Land and Water Conservation fund. Finally the Wildlife Diversity Fund contributed $2-million. State Senator Joe Uecker, whose district includes Brown County, was instrumental in getting all the funding approval through the legislative process. 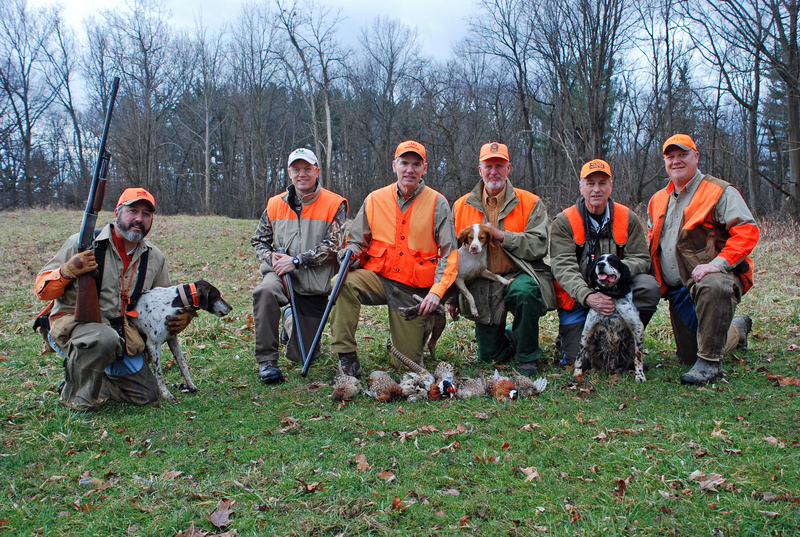 Senator Uecker also serves as Chair of the Ohio Legislative Sportsmen’s Caucus. Senator Uecker added, “When I came here in the early stages of the project and walked around the property it was readily apparent this is exactly what Ohio’s sportsmen and women would want. This really fits the bill for hunting and fishing access. It was pretty easy to sell the project to colleagues in the legislature. Even on a cold winter day it is still so beautiful out here.” Senator Uecker also presented commendations on behalf of the General Assembly to Director Zehringer on the dedication plus a commendation to upon the Director’s retirement.